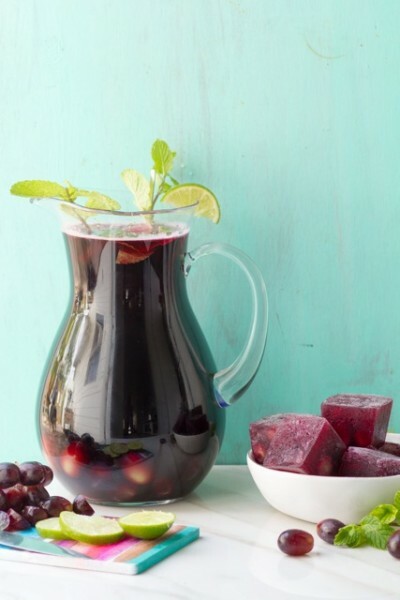 An easy spritzer to serve at your Passover Seder, or literally any day. 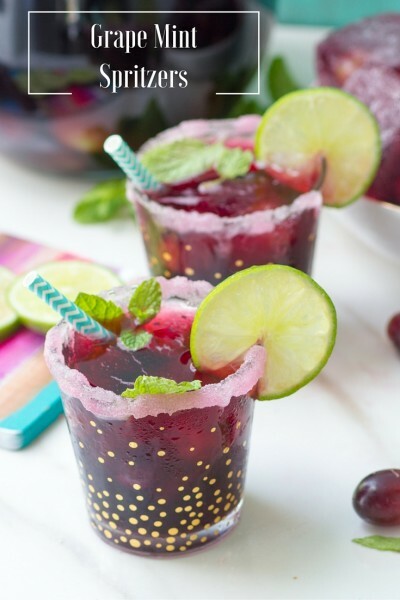 Grape Mint Spritzer with Grape Ice Cubes (vodka optional). Passover is commmiiingg! I know some of y’all dread cooking for Passover but I love it. I love hosting a Seder for my friends- Jews and Gentiles alike- complete with my famous brisket and obligatory four (or more) glasses of wine. And 30-year-olds searching for the afikomen like the prize is a brand new Escalade. I also love the traditions. 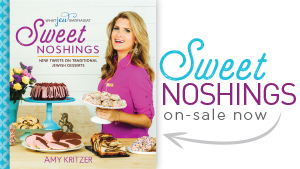 Even though my family is far away in blustery Connecticut, I always make Bubbe’s matzah ball soup, and have lots of Passover desserts too. WWBubbeDo? Eat all the chocolate covered matzah, that’s what. But of course I add new traditions too. Flourless chocolate cake with a spicy Texas twist, and a bevy of beverages. 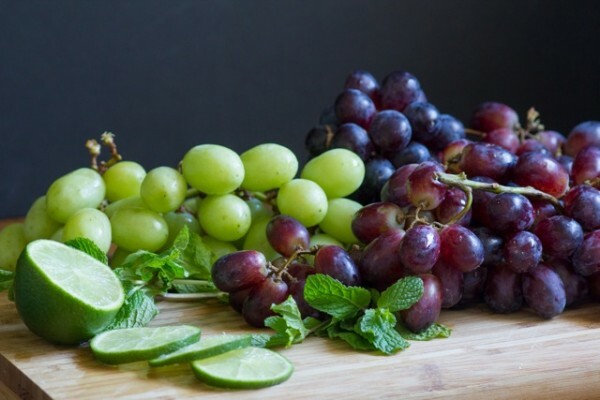 So this year, I’m pumped to partner with Welch’s Manischewitz 100% Grape Juice to come up with a few new recipes to add to the repertoire! 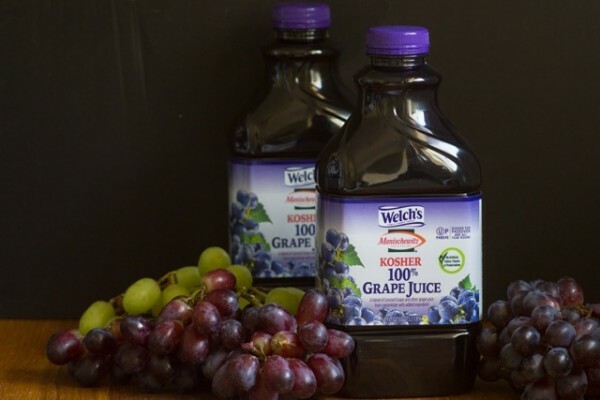 Welch’s and Manischewitz teamed up to create a kosher for Passover grape juice made from Concord grapes (those are the good ones). It has no artificial flavors, no artificial colors, no preservatives, no added sugar, nada. And it’s sulfite free! Good news, indeed. 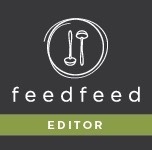 So this recipe is actually two recipes in one, because I’m sneaky like that. 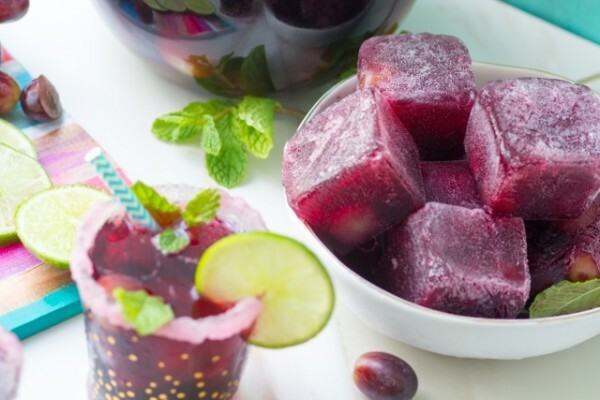 These grape ice cubes could totally be added to your favorite drinks. I see some wheels turning. 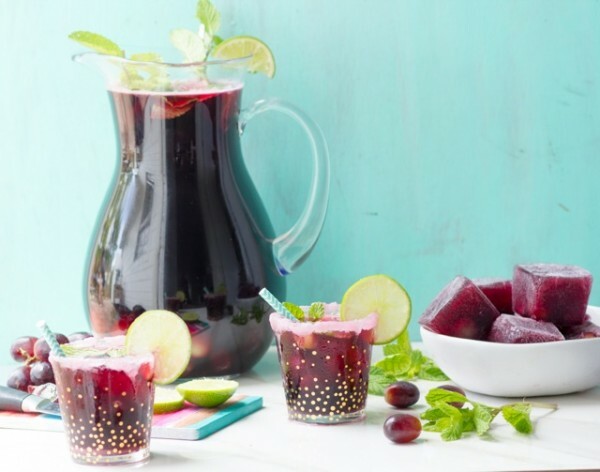 Or, use ’em to keep this Grape Mint Spritzer cold. When the ice melts, you just have more purple drank, not watery blah drink. Smart, right? 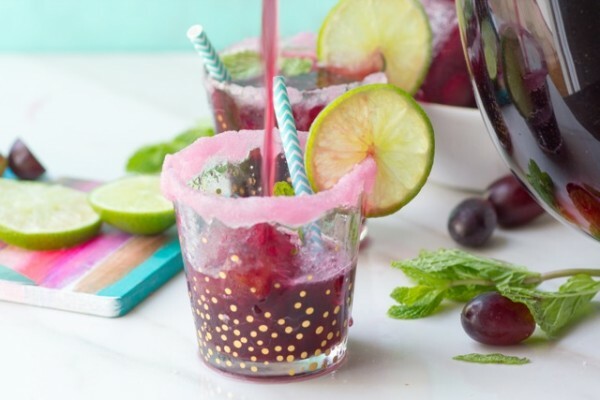 But because I don’t know my limits, I also added a grape sugar rim. Garnished with lime and mint! Kinda, maybe adorable? 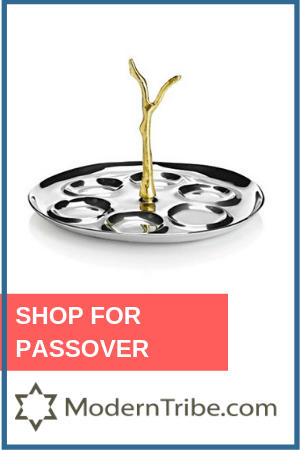 For your seder? I know one of the four questions is not, “But Amy, can I add booze to this?” But, for the adults in the group, you can totally add some kosher for Passover vodka. 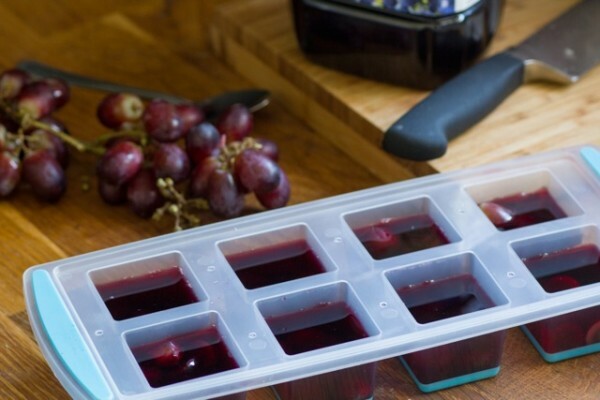 First, make the grapes ice cubes. 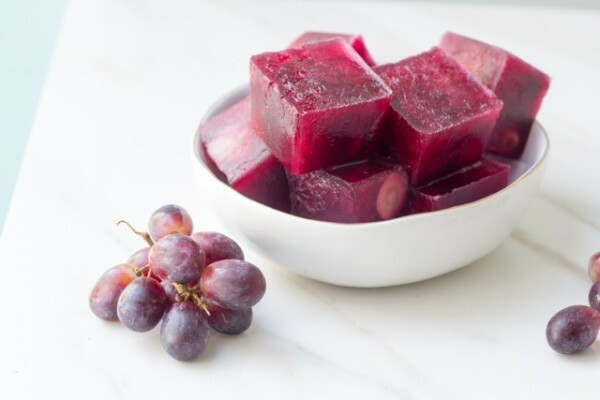 Place a few sliced grapes in ice cube molds and fill with grape juice. Freeze overnight or until ice cubes are solid. 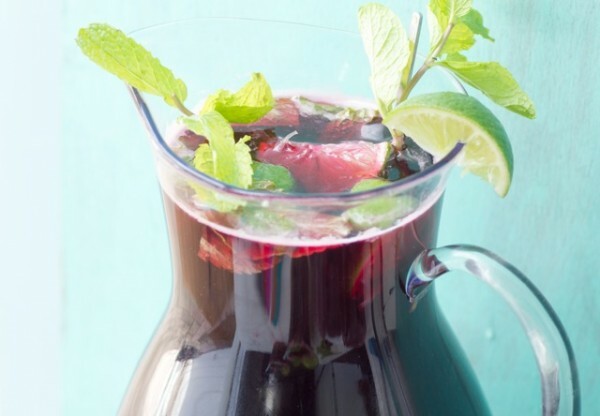 In a large pitcher, combine lime juice and mint leaves and crush with a wooden spoon to muddle. Then add remaining grapes, grape juice (save a little for rim) and sparkling water. To serve, mix a little grape juice with granulated sugar. 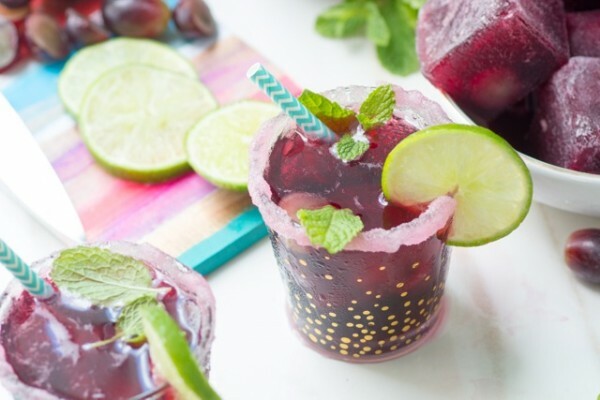 Rim cups with lime juice and then the grape sugar mixture. Place ice cubes in glasses, and then pour spritzer into glasses and garnish with limes and mint. You also need time for the ice to set. 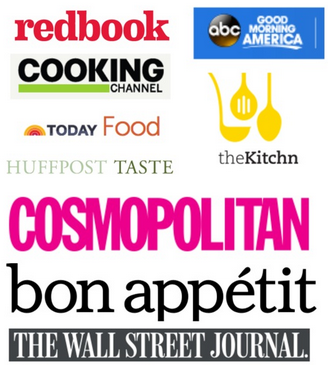 I partnered with Welch’s Manischewitz 100% Grape Juice on this post. 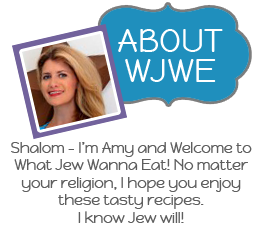 Thanks for supporting WJWE. Jew rock!